Alabama Bloggers: How Did Alabama Get the Short End of the Beach Stick? How Did Alabama Get the Short End of the Beach Stick? There is nothing I love better than going to the beach, and I especially love that I can go to the beach and still be loyal to my wonderful state at the same time. However, Have you noticed that someone is a bit of a hog down there? 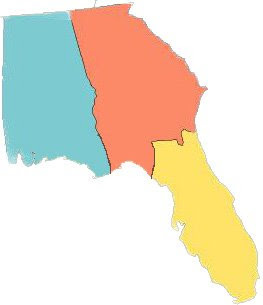 I mean COME ON - Florida has a completely three-sided peninsula with thousands of miles of coastline that is in both the Atlantic Ocean and the Gulf of Mexico, but they still HAD to come across Georgia and steal most of our beach too!?!?!? Florida has over 2,200 miles of coastline. Do you know how many miles Alabama has? 60. Our border with Florida is over 150 miles long. If you figure in the curves and dips and squigglies of the coastline, that's AT LEAST 200 miles of coastline. I can see Florida getting their slickest Politician Salesman with the greasy hair and the fancy suit to come offer to do us a favor: "We want to be good neighbors. That land over there? The nasty sandy land? It's eat up with crabs and sharks and hurricanes!! We'll take the responsibility of that awful land so that you don't have to suffer from all of those ailments." And how can we take them back? I know it CAN happen, because several years ago when the Perdido Bridge was built, Florida "gave" Alabama an extra mile or so if we agreed to build the bridge. So we ARE taking it back, one mile at a time! At any rate, here's my proposal, Florida. Take it or leave it (funny, I think I know the answer to that option). I've been to a lot of beaches but I still love the AL Gulf Coast. Say what you will about the "Redneck Riviera", I love the warm water, the family atmosphere, and the great food! I spent last week on the beautiful beaches of Orange Beach, AL. I posted pictures of it on my blog today and will post plenty more tomorrow! Haha! Rachel this is hillarious! And I couldn't agree with you more! We're Orange Beach people, through and through! I am glad to see all the Orange Beach people, our economy needs them. Our beaches are best. Just returned from Gulf Shores... with a sun burn to prove it! I definitely think you should submit your revised state lines to the legislature and see what they can do about this. Haha!